Matthew Welch Bagpipe Quintet "
THE MUSIC OF MATTHEW WELCH STEMS FROM A REMARKABLY MULTI-FACETED FOUNDATION. MATTHEW HOLDS TWO UNIVERSITY DEGREES IN EXPERIMENTAL MUSIC COMPOSITION AND HAS STUDIED WITH NOTED COMPOSERS SUCH AS BARRY TRUAX, RODNEY SHARMAN, ALVIN LUCIER AND ANTHONY BRAXTON. THE RECORDINGS ON “LUMINOSITY” BRING TOGETHER THE FULL RANGE AND DIVERSITY OF MATTHEW WELCH’S MUSICAL WORLD. HIS COMPOSITIONS RANGE FROM TRADITIONAL-LIKE BAGPIPE TUNES TO IMPROVISATION STRATEGIES AND FULLY NOTATED WORKS FOR SOLO INSTRUMENTS, CHAMBER ENSEMBLES AND ORCHESTRA. “LUMINOSITY” IS A TRULY REMARKABLE DOCUMENTATION OF THE TALENTS OF THIS MODERN COMPOSER. HIGHLY RECOMMENDED FOR THOSE SEEKING ADVENTUROUS MUSIC. 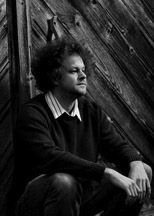 Matthew Welch’s reputation as a gifted young composer is sometimes compromised by his novel use of the bagpipes. The New Yorker’s sparse discography is full of Scottish winds, making it easy to mistake Welch as a one-trick pony. But his work often moves beyond the pipes’ polarizing and distinctive sound. Welch’s previous release, the excellent Dream Tigers, contained gamelan, a string quartet, and a minimalist composition for two clarinets. On Luminosity, Welch forces those familiar with his work to reconsider his pigeonhole by centering the disc around two pieces that stretch past 20 minutes each, with nary a note of the bagpipes’ signature tone in either. Luminosity‘s two large ensemble works, “Self/Non-Self and Luminosity in the Bardo” and “Symphony of Drones #1,” come from quite different places. The former is inspired by reflections on the Tibetan Book of the Dead, the latter a structural exploration of improvisation via graphic notation. But they share a dark, serious, and moody tone. “Self/Non-Self…” follows Zeena Parkins’ harp through a dark gauntlet of chamber arrangements in a representation (to paraphrase) of the ego’s travel in the Bardo, the world between human expiration and whatever life comes next. Parkins’ harp is a twinkling and light protagonist amidst alternations between foreboding darkness and lush, infrequent melodicism. “Symphony of Drones #1” has no narrative arc whatsoever, and is more a series of sustained tones interrupted by chaos and dissonance. What the piece shares with “Self/Non-Self,” however, is a palpable tension: a sense of the unexpected around the corner and the unknown just beyond the limits of one’s vision. An impressive cadre of young New Yorkers, including Jessica Pavone, Trevor Dunn, Taylor Ho Bynum and others, makes their way through 22 minutes of ebb and flow, their improvisation as much a rudder for the composition as Welch’s graphic score. Throughout, however, there’s cohesiveness, a tonal glue that provides some of the feeling in a recording that’s more than a conceptual exercise. Unexpectedly, Luminosity‘s four selections for bagpipes feel more like interludes. Each features a crowded field of tones and timbres, no matter how many performers are creating the music. The four tracks move from a solo performance to a duo, then to trio and quartet. Performing in the resonant ruins of a Scottish abbey, Welch accompanies himself in a whirlwind of sound. On each of these compositions, Welch explores synchronicity and discord via the magic of massed pipes. It’s all beautiful, unruly and complex, buoyed by that familiar-yet-exotic sound. NATE WOOLEY "THROW DOWN YOUR HAMMER AND SING"